Gonzo's Quest mobile slot is five years old and it hasn't aged a day. Launched in 2010, it was NetEnt's first foray into platinum video slots games and what an engaging experience it is! The wildly popular Avalanche feature, seen in games such as Robin Hood pushes this slot into the stratosphere of the best games ever. Gonzo's Quest has found success at many phone casinos, but there's nowhere better to enjoy this unique game than at Spin Genie mobile casino. Hands down, this is one of the most popular and famous mobile slots of all time. It follows a story of conquistador Gonzalo Pizzaro in his quest for massive treasures in South America, giving us great animation, super entertaining gameplay and wins that are worthy of a trip halfway around the world. And if the El Dorado is superb game graphics and animation techniques, then we've found it! NetEnt always go above and beyond of what we expect in terms of audiovisual possibilities in modern day game making, just look at Starburst or Jack and the Beanstalk. In fact, we are convinced that NetEnt have found the fountain of youth with this slot, because you would never guess that it was released over five years ago. Actually, it has become somewhat of a legend within the mobile gambling community and players seek this game out in nearly every casino. How do we know? Well, the fact that casinos always feature Gonzo's Quest in their promotions is a telling fact. Nearly all the special extra spins promotions include Gonzo's quest, because it's such a magnificent game, offering hours upon hours of graphically and audiovisually splendid entertainment. 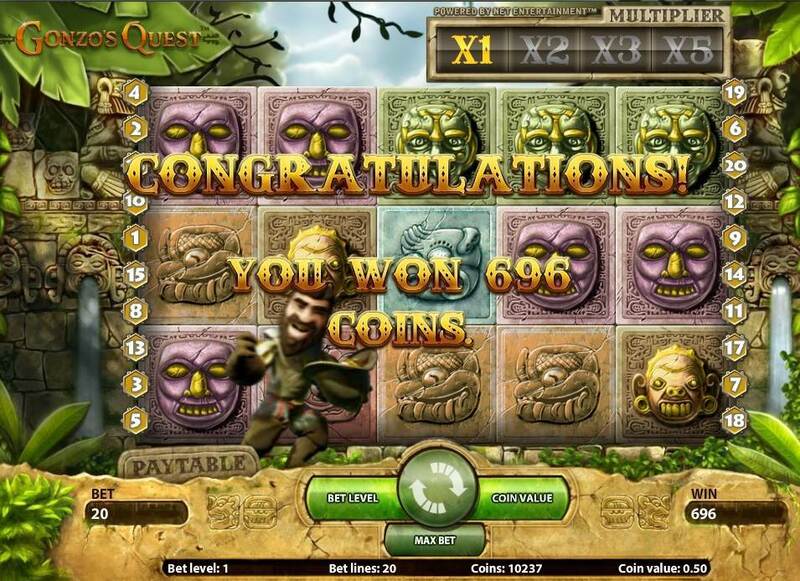 And who could have thought that NetEnt could achieve such fame and success with a slot that has an Aztec jungle theme…. The entire experience, from loading the game up, to the main gameplay, to the bonus features, the gaming experience is vibrant and seamless. Plus, Gonzo's Quest is available on every mobile device fathomable, albeit in a stripped-down version without all the graphic bells and whistles, such as Gonzo moon-walking across the screen. Who needs that when you've got the multipliers and the avalanche reels! This crafty slot offers up more than its superb gameplay and a few specs of gold here and there. In fact, make it your mission to get the most of this medium variance slot because there are definitely wins to be had. The return-to-player of Gonzo's Quest mobile slot is a very decent 96%, and let us be the ones to tell you that this 5 reel, 20 payline game will yield moderate size wins pretty often. You can bet anywhere from just 20p to £50 and expect a maximum yield of 93,750 coins! When we checked this game out for this review, approximately half of the spins contained a win. These weren't absolutely mammoth, but enough to keep us well in the surplus. And if you do manage to strike gold and find the El Dorado, figuratively speaking of course, it will most likely be through one of the game features and not the regular gameplay. So, more than huge wins, Gonzo's Quest has grown in popularity because of the entertainment that it offers and because it's darn good looking. This mobile slot keeps giving small to medium wins to keep you interested, but the main draw is in the features, more on which below. Innovation is the name of the game…well, no. Gonzo's Quest is actually the name of the game, but there was plenty of innovation when it came to designing the game features. NetEnt have done a fab job instilling a real sense of adventure and excitement into this game, thanks to the Avalanche Reels, the Multipliers and the Extra Spins Rounds. There are no spins in Gonzo's Quest, per se, so forget the traditional reels as you know them. NetEnt were really the pioneers in the gaming industry with their Avalanche Reels, which is a feature that was unlike any other at the time. Perhaps that's why it captivated the imaginations of the audiences, as the symbols fall from the skies above. But that's not all – they keep on giving! Let us explain. If you score a combination that is a winning one, the symbols which created it will wiggle around and vanish into dust, leaving plenty of space for new symbols to drop down into their place, absolutely for free. So by just spinning once, you've potentially got endless chance to win, i.e. the feature goes on until there are no more wins. That's also where the multipliers come into play. In regular game mode, i.e. not extra spins, there are 2x, 3x and 5x mutlipliers. Although your first win will be paid out regularly, the subsequent wins that you achieve through the Avalanche Reels feature will have a multiplier applied to them. You will watch in awe when you get four wins in a row and it's all multiplied by five! Now, that's some great winning potential, we'd say. Whatever you call it, Gonzo's Quest does have a 10 extra spins round in store for the lucky ones who trigger it by getting three Free Falls symbols (left). Contrary to 99.9% other slots, the Wilds (a grey question mark symbol) can substitute for the Free Falls symbol, so free falls are much easier to come by. A beautiful video segment will then appear: the reels will split into two and open up, allowing Gonzo to run towards the horizon in chase of El Dorado. When you get to the Free Falls mode, you will also notice that your multipliers are increased as well. So instead of 2x, 3x and 5x, you've got yourself a chance to get 3x, 6x, 9x and even 15x multiplier! Just imagine what this can do to your wallet! Make it very happy indeed. And compare these multipliers to just 3x or 5x on other games' extra spins rounds… Gonzo's Quest is a great proposition indeed. Although on paper, you've got 10 free falls, taking into consideration the Avalanche Reels, you actually can get up to 40 goes at scoring yourself a really massive win. The Free Falls feature regularly pays out sizable sums and there are even stories of people getting life-changing sums from it. Want to play Gonzo's Quest? Gonzo's Quest is an undying classic — a highly rewarding mobile slot! Gonzo's Quest It's like Sophie's choice of online gaming - Gonzo's Quest, Jack and the Beanstalk or Starburst? If we had to choose, we'd feel inclined to repeat what we said in the headline - Gonzo is, in fact, our all time favourite! There you have it. Even after five years after its release, Gonzo's Quest still holds up against the current crop of slots games. It's not stingy on features either: the Avalanche Reels, Free Falls and multiplier features are innovative, while the 3D graphics are visually stunning. The game's overall performance is smooth, addictive and never tiresome. We're fairly sure we could be saying something similar in 2020. Plus, the addition of a lovable cartoon character of Pizzaro makes this slot really entertaining, authentic and even humorous at times, a winning combination in our opinion. Check him out, moon-walking across the screen at a time when you'd rather see the reels themselves or trying to catch the coins from the golden coin waterfall that follows a Free Falls round. All in all, it's a beautiful slot with many features and an amicable story line, a perfect mobile slot for those looking to stretch their budget a little and make it last a while, while still hoping to get a very decent return during the Free Falls rounds. Gonzo's Quest is easily one of the most popular NetEnt mobile slots and we are sure you're going to want to give it a go, so why not try it at Spin Genie, where you will also get 100 extra spins?